The drum brakes on GM 14 bolt axles are disappearing, and no one is going to miss them. 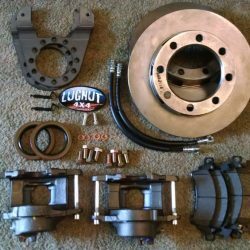 Drum brakes have a lot of limitations, and 14 bolt disc brake conversion kits are more affordable than ever (click here to see for yourself). If you’re wondering what a 14 bolt axle is, you may not be alone. This type of axle is called a “14 bolt axle” because 14 bolts are used to attach the rear differential cover to the differential case. GM has been putting this axle in 3/4 ton and 1 ton trucks since 1973. It is a very durable axle, and millions of them have been produced. We admit we’re a little bit biased against drum brakes. But, we think that there are at least five great factual reasons to convert drum brakes over to disc brakes if you’ve got a 14 bolt axle. Drum Scoring – Over time, grooves develop on the braking surface of the drum, reducing brake system performance. While this can be ‘fixed’ by re-boring the drum, there’s a limit to the number of times this can be done before the drum must be replaced. Out-of-Round Drums – Many drum brake systems have issues with uneven wear that results in a drum that’s slightly out of round. An out of round drum will not work smoothly, and will cause uneven brake shoe wear. Reboring the drum can fix this. But, drums can only be rebored so many times before they have to be replaced. Martensite Spots – A brake drum that’s not functioning correctly can develop martensite spots. These are slightly raised and extremely hard dark-colored spots on the drum. These spots cause all sorts of problems with performance, noise, and function, and they can not be removed. So, if your drum brakes don’t work just right, martensite spots may develop and you’ll have to replace the drum. Cracked Drums – Brake drums crack due to excessive heating. Once they crack the only option is to replace the entire drum. Mediocre Performance – On it’s very best day, a drum brake system offers less overall stopping performance than a set of disc brakes. This is why you can’t find drum brakes on a race car or high performance off-road vehicle – they just don’t perform as well. Fade – Drum brakes will fade quickly during towing or hauling, simply because they can’t dissipate a lot of heat. This can lead to inconsistent brake performance in stop and go driving, and it can make mountain driving exciting (and not in a good way). Rust – Drum brake systems are sort of famous for having rust issues, at least if water gets inside the drum (which can happen if you take your vehicle off-road). A little bit of rust usually isn’t a big problem, but it doesn’t take long for a ‘little’ rust problem to get out of hand. While drum brakes can be fine for day-to-day driving, they are inferior to disc brakes in situations where brake performance is vital. 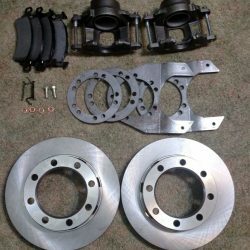 Truck owners that tow and haul a lot will say that upgrading from drum brakes to disc brakes is a massive improvement. 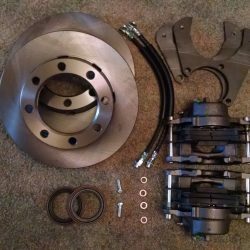 If you’re upgrading from a drum brake to a disc brake setup, you have a lot of options when it comes to rotors, calipers, and pads. You can opt for standard or slotted rotors. Slotted rotors provide better performance in high-heat situations (like towing, hauling, or racing). You can opt for a variety of brake pad materials. Ceramic pads are quiet and offer great all-around performance. Semi-metallic pads offer good performance at a lower cost with more noise. With drum brakes, you often have no options. Sometimes you can select between different brands of parts, but that’s about it. Drum brake systems are heavy, especially when we’re talking about a 14 bolt axle. The drum setup on a full floating 14 bolt axle can weigh 50 lbs more than a disc brake kit for the same axle. You might think that 50 lbs isn’t much on a 1-ton truck. But it’s 50 lbs that moves up and down every time you go across a pothole, every time you drive across an expansion joint, etc. When you remove weight from the axle, you make the suspension’s job just a little bit easier. Many truck owners who convert from drums to discs report a slight improvement in ride quality. Shocks should also last a little longer, as they are not working so hard. One of the easiest ways to have a problem with a drum brake system is to ignore it. That’s because drum brake systems need to be checked frequently for proper operation. Inspecting drum brakes is a pain, as you need to pull the drum off to see the shoes. Adjustments should be made when brake shoes aren’t being applied evenly. With disc brakes, you don’t have to do anything other than visually inspect the pads every time you rotate your tires. Most shops will check your brake pads free of charge too. While disc brake pads aren’t quite as easy to replace as drum brake shoes, it’s still pretty easy. And, they don’t require near as much work between replacements. Last but not least, disc brakes have better pedal feel. If you’re driving an older truck or an off-road vehicle, brake pedal feel is one of the little things that can really mean a lot. A pedal that provides good feedback makes it easier to control the brakes. And that is confidence inspiring. Even when not fading, drum brakes don’t stop as well as disc brakes. Disc brakes are easier to maintain. Disc brakes have a lot of other functional benefits. 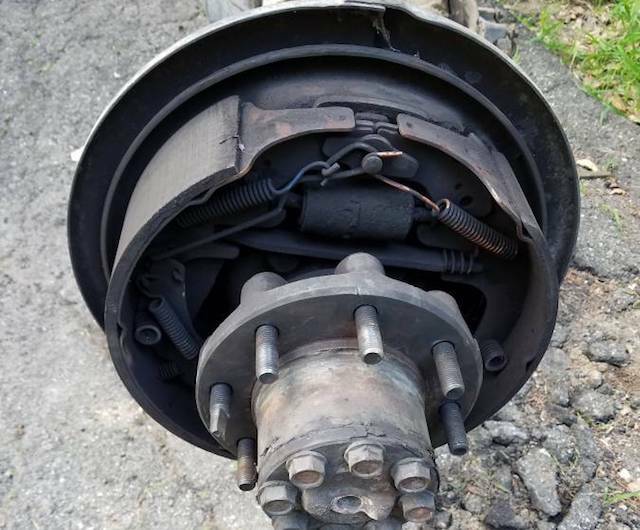 Is there a good reason to keep drum brakes on your 14 bolt axle? Well, upgrading to disc brakes isn’t free. While we’ve got some of the lowest priced drum brake conversion kits on the market, we understand that a disc brake upgrade isn’t always in the budget. But, have you thought about how much a brake problem can cost if it results in a collision? If a disc brake system helps prevent a collision, the upgrade is money well spent.